AP January 21, 2017 MELBOURNE, Australia (AP) — Bob and Mike Bryan are retiring from Davis Cup play after 14 years representing the United States. The 38-year-old twin brothers made the announcement on their Instagram account, saying that clinching the 2007 Davis Cup final was "one of the greatest highlights of our career." "We've been blessed to play for two amazing captains, Patrick McEnroe and Jim Courier, and we are extremely grateful for their leadership and trust. "We'd like to extend our dearest gratitude to our fellow teammates, USTA staff, our friends and family, and the passionate fans who have been there for us on this incredible journey." Courier, the current head of the U.S. Davis Cup team, wrote in an email to The Associated Press: "I had many discussions with Bob and Mike in December and I understand their desire to trim their schedule after so many years of sacrifice for the team. They will go down as two of our greatest Davis Cup players and it's been a privilege to be on the team with them for the past six years. They have been an inspiration and will be sorely missed." McEnroe tweeted: "It was an absolute honor to be your captain." 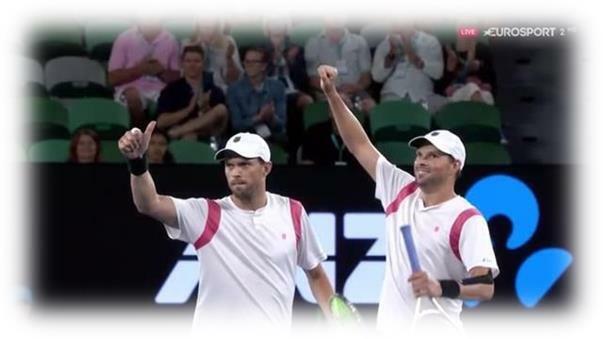 The Bryans are continuing to play the ATP tour and started the season in spectacular form reaching the finals of the Australian Open. The Bryans have the most victories by any doubles team in U.S. Davis Cup history, going 24-5, including 4-0 in 2007 when the U.S. won the title. The brothers beat Nikolay Davydenko and Igor Andreev in the doubles to clinch the final against Russia. The twins, who were born in Camarillo, California, also won the Olympic gold medal in London in 2012 and bronze at Beijing in 2008. They elected not to compete in 2016. Dave Haggerty, president of the International Tennis Federation, said the Bryans had shown "outstanding commitment, dedication and passion" for the Davis Cup. "The Bryan brothers have already received the ITF's Commitment Award, which recognizes players who have shown long-standing dedication to the Davis Cup by playing in at least 20 home or away ties," Haggerty said. "They symbolize what the Davis Cup is all about." They're the only team in Open era history to hold all four Grand Slam men's doubles titles at the same time. They hold the all-time record with 16 Grand Slams. In mixed doubles, left-hander Bob has seven Grand Slam titles and right-hander Mike has four.